It is not easy to understand the importance of protecting Wilderness if you do not have any first-hand Wilderness experience. The current way of life mostly prevents us from getting such experiences. However, we can still find and experience wild nature and Wilderness, or at least elements of it, in Europe. Wildlife watching is a popular way to get such a Wilderness experience. To experience Wilderness in Central Europe, or anywhere else in the world, some things have to be taken into consideration. Having more people out in the Wilderness means more support to the cause of protecting it, but simultaneously causes a bigger threat to the Wilderness itself. Wilderness generally only survived in Europe due to its remoteness and inaccessibility. With more cars and more roads these areas get more accessible. Wilderness advocates fear that this will bring new and serious threats. However, if less and less people have a real Wilderness experience, understand and experience the power of Wilderness, less support can be gained to protect Wilderness in the future. To help deal with this dilemma, at least partially, one solution is to implement a Wilderness ethic in order to avoid any unnecessary human influences to the Wilderness. Observing wildlife is one of the most attractive ways to experience Wilderness. Many people see wildlife as a synonym for Wilderness. A result of this is that many people emotionally connect to nature through wildlife watching. However, people are often not aware how harmful such an activity can be for wildlife. Spanish researchers, members of the Cantabarian Brown Bear research group, reviewed the consequences of brown bear viewing tourism in a 2016 paper. It is usually harmless to watch animals like deer peacefully grazing from a distance. This allows you to connect with wildlife while not disturbing their natural behaviour. Watching carnivores, on the other hand, is much more demanding but because of this likely more attractive as well. The natural way of life of carnivores, such as wolf or lynx, generally makes them unsuitable subjects for observation as they tend to be shy and avoid humans. They are mostly active and searching for food in the dark or in the twilight. So when humans attempt to observe carnivores in the wild, they may cause the animal to flee and thus stopping it from conducting its natural behaviour. Where the presence of humans alters an animals natural behaviour, problems arise. Particularly, when a disturbance occurs frequently from a stream of humans trying to catch a glimpse of the wild animals. Therefore, it is very important to carefully consider the direct and indirect effects of observing wildlife, especially carnivores. However, as observing wildlife, particularly bears, is seen as an attractive and profitable activity, many tour operators continue to offer it to paying clients. Unfortunately, many tour operators focus more on the people, and their safety, than on the well-being of the bear. A standard scenario might look like this: a wild bear hides out in the woods. The operator installs some kind of bait, mostly vegetarian products but unfortunately also often carcasses (which is illegal in many countries), on a small meadow near the forest. These places are often accessible by motorised vehicles to make the experience more convenient for visitors. The bait will attract the bear, who will then likely walk over to it where the visitors can observe it. The negative impacts on the bear’s behaviour from observing bears like this were detected quite early. People quickly realised that it was a dangerous activity for both: the people and the bear. Bears quickly get used to the presence of humans and their food, and can develop dangerous behaviour. The bear will connect humans and their structures with food and will consequently start looking for food near people, meaning on campgrounds, cars, garbage bins or next to touristic infrastructure. Brown bears, like golden jackals, are omnivores, therefore, human garbage can be an attractive source of food. Feeding bears in order to be able to observe them habituates the animals for unnatural food sources. This can lead to a loss of respect for humans. To enable bears to live and feed in a natural way and to avoid conflicts with them, it is essential to not feed them. Furthermore, we have to store food or scented objects properly when travelling in bear territory. It has been proven that when a bear loses fear of humans and starts to search for human food he will likely, very soon, be a dead bear. Such a change in the natural bear behaviour increases the chance of the animal becoming a threat to people and becoming a so-called ‘problem bear’. Unfortunately, such problem bears mostly end up killed. Feeding wild animals to observe them is in no way compatible with a Wilderness ethic. When visiting Wilderness we have to keep in mind that we are only visitors in the home of wildlife. Therefore, we should behave in a way as we like to be treated if somebody is visiting our home. We have to respect the natural behaviour of wildlife and have to do our best to not interfere with their way of life. This means: taking all our garbage out, not disturbing or feeding wildlife, storing our belongings, particularly food and scented objects, safely, staying on the trails and follow the rules of the place we visit. In fitting with our European Outdoor Ethics, no disturbance should occur to wildlife. This means that while you observe them you should not disturb them from conducting there natural behaviours. The travel company Adventoura Slovakia tries to prove that there is also another way to do it. Bear watching is not their main activity. The company bases their portfolio on ethically experiencing and educating about nature and Wilderness. The company informs their visitors that it is not guaranteed to see a bear during the tour. 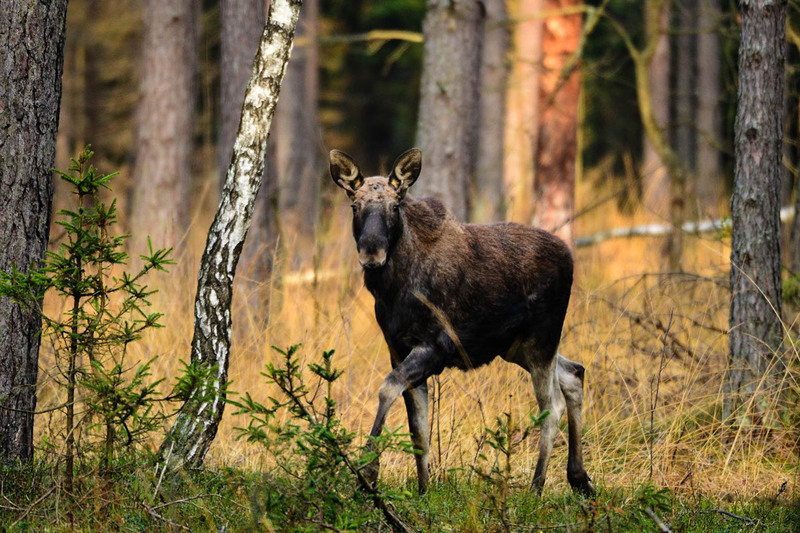 However, they are likely to spot deer, chamois, birds, elk and many other wild animals. This uncertainty is also used to explain the concept of Wilderness – an unpredictable and uncontrolled piece of land. The company does not use baits to attract bears but prefers to educate the visitors about the bear’s habitat and the history of the land. The whole tour is by foot without any motorised vehicles. This kind of experience is becoming more popular with tourists, as awareness about sustainable and ethical experiences in the wild is raised. It provides a way to experience Wilderness without causing a negative effect on the area and its inhabitants.